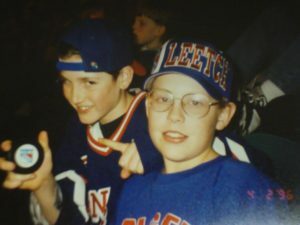 In 1996, I was 14 years old and in love with hockey. In those days, it was actually quite normal for kids to play outside (gasp!) in the streets (GASP! ), and one of my best friends at the time was a fellow street hockey guy named Dan. Dan lived around the block from me and was–and still is!–a fellow New York Rangers fan. He knew I had never been to Madison Square Garden for a Rangers game before, and apparently, this was not okay with him. One night in late March, there came a knock on my mother’s front door. Standing on our porch was Dan, accompanied by his father, Phil. They proceeded to invite me to the April 2 Rangers game against the New Jersey Devils. I was beyond ecstatic. I was going to be seeing some of the greatest players in hockey history…Mark Messier, Brian Leetch, Mike Richter and Adam Graves, to name a few…IN THE FLESH! The game was awesome…at the height of the Devils-Rangers rivalry, there was fast-paced action, plenty of exciting moments, and the crowd was simply electric. Alexei Kovalev scored 2 early goals and Messier sealed the deal with an empty-net goal for a 3-1 Rangers win. During the car ride home, I thought to myself that I should somehow find a way to repay Dan’s father for bringing me to my first-ever game. I swore to myself that I wouldn’t forget. What can I say? When you’re 14 years old and growing up, life is a blur, and it’s very easy to forget things. After all, EVERYTHING is a distraction. You have to start high school…classes are difficult…teachers are intimidating…there are so many faces in the halls…girls’ legs grow longer…you get your first car…you hang out at the mall every weekend…etc., etc. Years and years went by, and Dan and I fell out of touch. And, during all the countless times that I returned to my hometown to visit my mother, I never did think to simply walk around the block to reconnect with Dan’s dad. Although it took me a bit longer than I would have liked, I’m pleased to share that I did indeed make the walk around the block. 17 years after my first Rangers game with Dan and Phil, I strolled around the block to my buddy Dan’s house. Dan has long since moved out of our hometown and is making a life for himself in San Francisco. But that’s okay, because I wasn’t looking for Dan…I was looking for his father. He smiled, politely accepted my offer, and I’m pleased to share that the two of us were in attendance at Madison Square Garden on December 15, 2013 (exactly three years ago today), for another Rangers game. The gasp and the GASP are funny. True, right? Violence and kidnappings are making parents paranoid these days. I try to have a semblance of that with my growing boys through unsupervised play. I let them go knock at their friend’s house (yes, that’s still possible where we live here in Seoul!) and a few friends would come over unannounced at our house. The friends’ parents and I agree that it’s just like during our time. Kudos to you for this tribute to your friend’s dad. We’re lucky if we have that kind of person while growing up. Your post wants me to pay it forward… kids these days need some people to look back on (not things like their computer and cell phones). I grew up in Calgary, Alberta during the Battle of Alberta with Messier, Lanny McDonald etc… ahh, the Glory Days. I imagine it must’ve taken a bit of courage to take that walk around the block 17 years after that first game. Did he remember you after you told him your name? Awwwy, this is an inspiring post. When I was college, I sent a thank you letter to my preschool teacher. After few years, she asked me to be the guest speaker in the preschool moving up ceremony. We were both inspired by each other. I really do believe in the ripple effect of good deeds. That’s such a sweet story. It’s funny how we lose touch with people, isn’t it! Even if they just live around the corner. I bet his dad was so pleased that you returned the favour, after all those years! That’s so great. I’ve often thought of people that made a huge impact on me when I was younger and how they probably don’t even know they did. Simple acts or sharing a game with a kid can mean so much. It’s great to be able to go back and share the memories and just let someone know that you appreciated a kind gesture even so long ago. Love this. Aww this is touching. It reminds me that life can be moving at lightning speed, but you just need to take a step back at times. I feel like there are things like this I haven’t done in years and it is crazy to think how long ago it was. Glad to know you reconnected. Thanks for sharing! Such a nice story! It’s so great that you were able to return the favour and take him to a game. Maybe he will tell Dan and the two of you can reconnect someday! That’s super thoughtful of you, and while it did take a while to return the favour, its still a wonderful feeling to be thought of an appreciated, no mateer how many years down the line. I bet it felt great to be able to take Dans dad to the game yourself – the gift of giving is truly great! Hah! What an adorable little story. Isn’t it amazing how we can lose touch and reconnect so quickly. I love the voice with which you wrote this article, as well. Wow, you took your friend’s dad to a Madison Square Garden Game? I bet your friend Dan was blue with envy. PS your kid picture is too funny, your devious smile is infectious. What a great reminder of how simple it can be to reach out and reconnect with people that were once important to us. As life goes on, we can get so caught up in it and lose track of all the important people in it. But it’s important to be intentional and mindful of who is in it and who we might want to be part of it again, like you did with Phil. Sports have a spectacularly binding characteristic, don’t they? This is a truly wonderful example of full-circle experiences, and it was a pleasure to read it. As a fellow sport-fan, I hope to have a similar experience some day (upon moving back to the states) with family and similar alma maters.